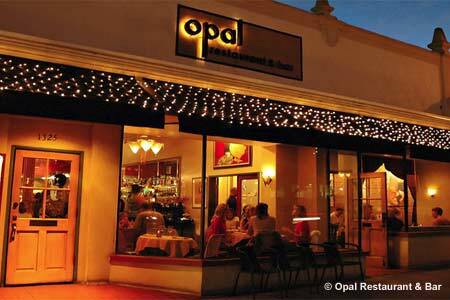 Opal offers eclectic, wine-friendly California cuisine in the heart of Santa Barbara's downtown theater district. : Opal offers California cuisine created from local products, with an emphasis on wine-friendly fare. Start with the signature tiger prawns wrapped in shredded phyllo and served with a silken coconut curry dipping sauce and a salad of napa cabbage, Mandarin oranges and toasted almonds --- an inspired experiment originally developed to celebrate Julia Child's 90th birthday. Among the gourmet pizzas baked in a wood-burning oven, we recommend the version topped with prosciutto, goat cheese, pesto and spinach. The main course line-up features lemon grass-crusted fresh salmon filet with apple-and-orange-zest jasmine rice and a Thai curry sauce; filet mignon prepared two ways, chile-crusted or herb-grilled; and New Zealand lamb with rosemary Zinfandel reduction. Desserts like a wild berry crème brûlée are made in-house. Three-hundred wines are available by the bottle and 40 are poured by the glass, with a strong showing of local wines. The full bar features a long list of inventive cosmos and specialty grappas. It can get loud inside so be prepared, but the energy is infectious.